People go to Twitter to find out what’s happening in the world around them. Because interests and passions bring them to the platform, they’re hungry to expand those interests—to discover new people, publications, and businesses. People Tweet about their likes/dislikes, how they spend their time, what they are reading or watching, where they are, etc. Because of this, their interests become clear very quickly. Twitter advertisers find people by targeting those interests (as well as their location, who a person follows, what they Tweet about, and so on). But how do the people on Twitter discover small businesses? And what do they do once they find them? And, if all that happens, how do they find out more? At Twitter Small Business, we wanted to find out too. So we teamed-up with Research Now and surveyed a global audience of over 5,450 people who follow small or medium-sized businesses (SMBs) on Twitter. We’ve compiled the results, and some really slick graphs, into our new Customer Insights Whitepaper: The value of a follower. How do SMB followers behave on Twitter? People who follow SMBs are active and engaged. Of the ones we surveyed, 90 percent get on Twitter each week and over half use Twitter every single day. When someone follows you on Twitter, they are opting in to see your Tweets. So seeing that these people log on so frequently means they’re seeing a lot of content from the businesses they follow. In fact, about a third of our audience reported that they recall reading Tweets from an SMB daily—another third, every time they log in. 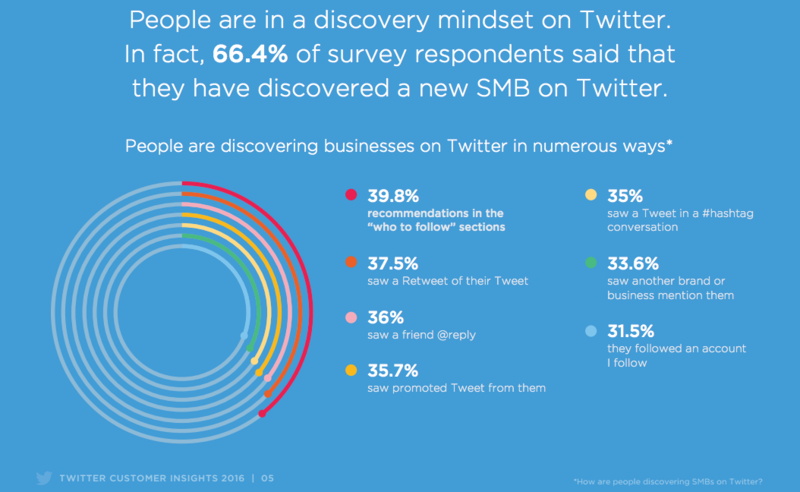 How do people discover SMBs on Twitter? People log on to Twitter enthusiastic about discovering new things. When it comes to SMBs, there a several ways people find new ones. The biggest funnel for people to discover an SMB is in the “who to follow” section. This section appears in the sidebar of the home page timeline and search pages. Businesses can promote their account to show up in “who to follow” or they can appear there organically if a person is already following similar accounts. 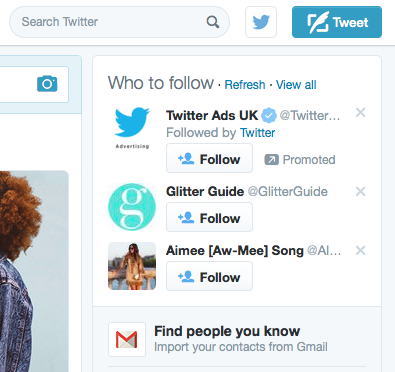 Around 35 percent of people remember finding a business because of its Promoted Tweet. People also take notice of businesses through Retweets. Experiment with compelling content to increase your Retweets, attract new followers, and keep them engaged over time. Over a third of people remember finding an SMB because a friend, or another business, replied to them. Businesses can also be discovered by entering conversations around hashtags or following new accounts. All of this proves that an SMB’s activity on Twitter—even if it’s not directly focused on follower growth—helps to get their name out there. Maintaining a lively Twitter account opens your business to the world. What’s in it for the SMB? 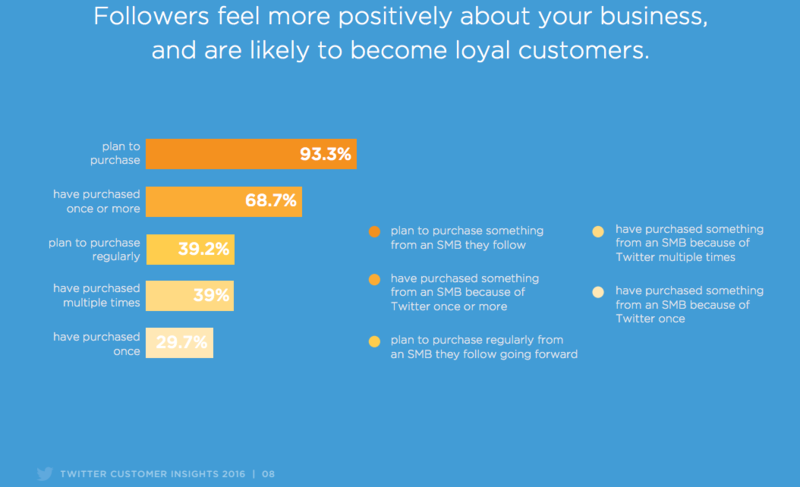 When someone follows an SMB on Twitter, they feel loyal to that business. About 93 percent of the people we surveyed said they plan to purchase from an SMB they follow and almost 70 percent have already purchased from those SMBs once or more. We saw a lot of repeat-buying behavior as well. Almost 40 percent of survey respondents have, or plan to, purchase regularly from the SMBs they follow. Even when someone isn’t explicitly focused on purchasing from an SMB, following the business made them a brand advocate. 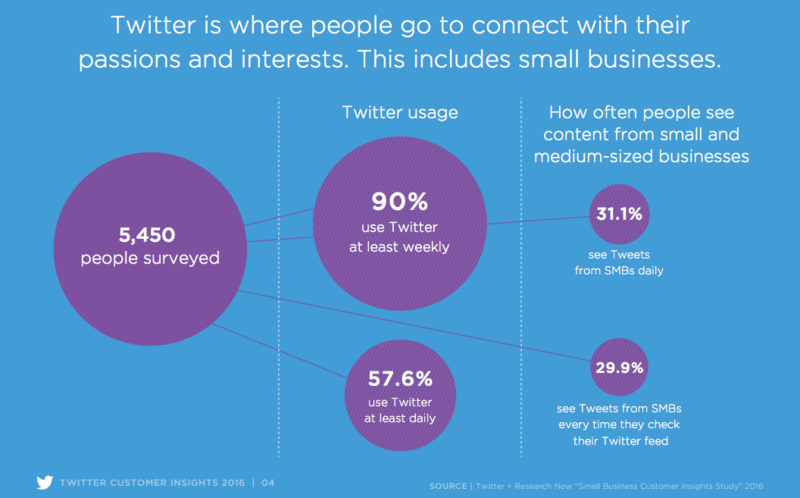 We found that 78.5 percent of people Tweeted at an SMB—half of them have Tweeted at that SMB multiple times. Over 80 percent of them felt even better about the business when the business replied to them on Twitter. Download the full Customer Insights White Paper to see even more stats on how people interact with and benefit SMBs on Twitter, including how followers interact with SMBs and how to promote your account to make it easier for people to find. Take a look at our SMB blog to stay up-to-date with our studies and product launches or follow us @TwitterSMB. Joe Wadlington is a Small Business Copywriter at Twitter. He lives, writes, and Tweets in San Francisco.